I am very pleased to say that my new book is going to make its belated appearance soon. If you have been following this saga, the first thing you may notice is that the title has changed. 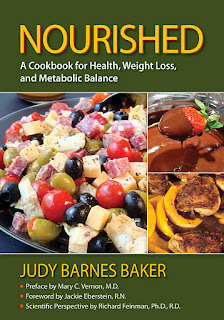 After my interview with Jimmy Moore http://livinlavidalowcarb.com/blog/the-llvlc-show-episode-469-judy-barnes-bakers-almost-ada-approved-low-carb-diabetic-cookbook/10714, one of my recipe testers contacted me to say that when she searched for the original title, Eating on the Edge, something totally different came up—a line of low-fat products and a book that had just come out. To avoid confusion, I changed my title to what you see above. The silver lining is that I like the new title better. (One person told me Eating on the Edge sounded like going to the jungle to eat bugs and worms, while Nourished sounds warm and comforting.) We are planning to celebrate the launch with a promotional event including some really great prizes. Details will be forthcoming. Your cover is beautiful, Judy. It looks very professional. I can't wait to get this book on my shelf. Thanks, Jennifer! Your new book, Low-Carbing Among Friends, also looks great! I'm enjoying my copy and looking forward to trying some of the recipes. Congratulations on a job well done. Thanks Stephanie. I couldn't have done it without your help! Judy, The cover and title are absolutely perfect. And if this follows the path you laid in "Carb Wars" then this too will be a must have for the low carb bookshelf! 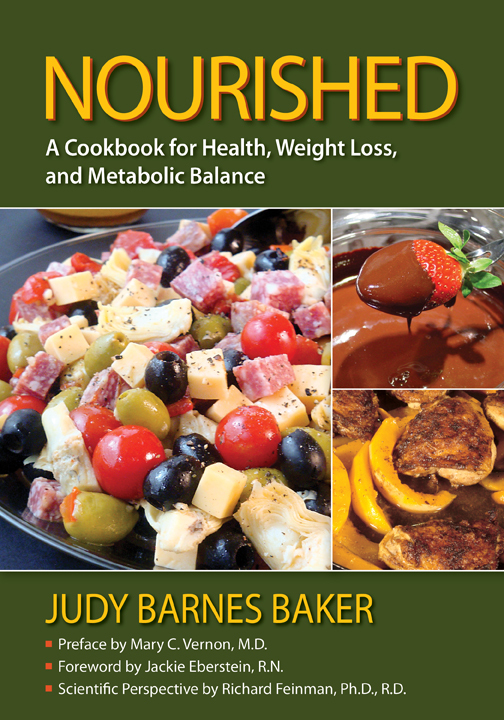 I have test baked for a new low carb company in the past and look forward to this new book and trying your recipes. It's comments like yours that keep me going. Thanks. I look forward to checking it out myself and reviewing it soon. Again, great job my friend! So proud of you!!! Any ebook plans? I'm pretty much reluctant to buy any publications on paper any more. Yes, indeed! I'm working on getting the e-book out as soon as possible. I hope to have it out by January 1st, but it may take a little longer. It's always hard to get anything done over the holidays. I agree – paperless is the way of the future. I’m not sure why the link from the Life after Bread article leads to this post. Here is the link to the book.